The Region VIII Federal Partners group will host "Improving the Health of Communities through the National Prevention Strategy 2013 Webinar Series." The Federal Partners Work Group consists of representatives from numerous regional federal agencies who meet on a regular basis to identify ways to effectively and efficiently work together in reaching and serving providers, consumers, partners, advocates and stakeholders. 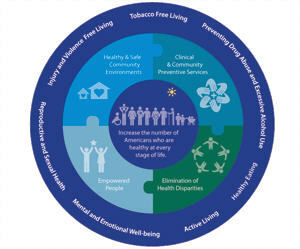 The National Prevention Strategy is a comprehensive plan that strives to improve the nation’s health through the active engagement of all sectors of society. Called for by the Affordable Care Act, the Strategy helps move the nation away from a health care system focused on sickness and disease to one focused on wellness and prevention. To learn more about these webinars, subscribe via email to LISTSERV@LIST.NIH.GOV and include "Subscribe REGIONVIII" and your name in the message.